James Barbour, circa 1878. 2-storey villa with 3-stage tower, Tudor detailing. Bull-faced, squared and snecked red sandstone, with ashlar base course, dividing band course, 1st floor cill course and eaves cornice, and ashlar tower. SW (ENTRANCE) ELEVATION: entrance tower to centre with segmental opening at ground flanked by paired pilasters with stylised capitals, shield and fleurons above; billetted lintel to door with plate glass fanlight; panelled door. Short flight of steps approaching entrance. 1st floor window above entrance with block pediment. Towerhead breaking eaves above with oculus and segmental-headed bipartite to SW, single windows to returns; mutuled cornice, fretted stone balustrade, dies and engaged flues to corners, and round-arched shelter at stairhead to platform roof. Bay to left with canted window at ground, triglyph and guttae details, blocking course and tablet, and corniced 1st floor window; 2-light arrowslit to curvilinear gablehead with obelisk finials. Bay to right canted with window to each face and polygonal roof, cast-iron finial. SE ELEVATION: curvilinear gabled bay to centre with canted window at ground and bipartite above; doorway flanking to left with window at 1st floor; advanced chimneybreast to left. Recessed bays of service wing to right. NE ELEVATION: curvilinear gabled bay to centre with projecting window at ground, corniced bipartite window at 1st floor above. Further gable to outer left. Windows to right. Modern glazing. Grey slate roof. Lead flashings. Wall and gablehead ashlar stacks with corniced coping. INTERIOR: timber stair with decoratively carved newel posts and ball finials; decorative plasterwork disguising support beams and to trabeated coved stairhead, with fine pitched rooflight and painted glass. Fine marble classical chimneypieces, 1 with paired contrasting green columned colonnettes. Deep skirting boards. ANCILLARY STRUCTURE: former stable, materially en suite. Single storey, rectangular-plan 5-bay piend-roofed range to E of house with 3 doors and 2 windows (now blocked), and with central gabled stone hayloft dormerhead. Grey slates. INTERIOR: cobbled floor, white-washed walls. Built by J H Houston whose name is carved on a stack viewed from the towerhead. 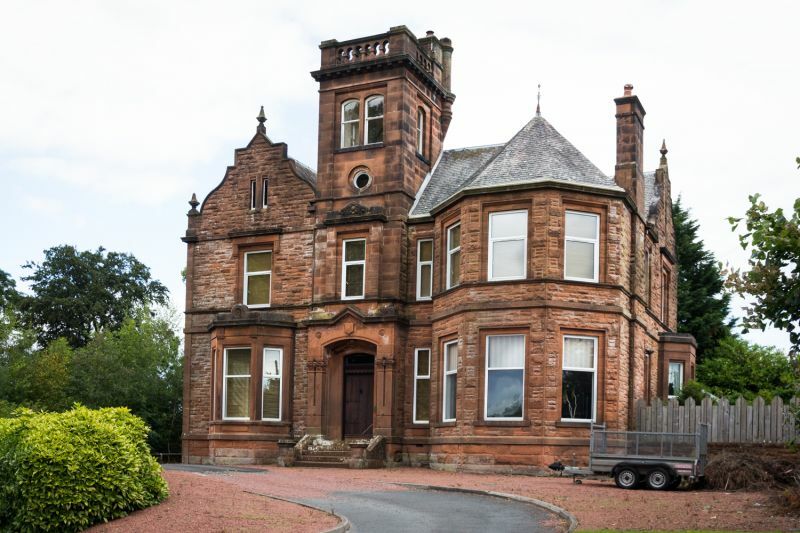 Houston's brother is believed to have built a villa in Lockerbie Road, Brownrig. Marchfield is prominently sited and a good example of a later Victorian villa.